The origins of the Cigarrera Wine cellar go back to 1758 when the distinguished merchant, Don Joseph Colóm Darbó, native of Barcelona and established in Sanlúcar, took on alease of some urban buildings in “Callejón del Truco”, the property of the order of the Mercedarios Descalzos, where a wine business was initiated. Sorne years later (1771), Don Joseph Colóm, with his son, Don Francisco de Paula Colóm Borrego, founded the company, Colóm and Company, in which they grouped all their businesses. In 1781, the company leased another property, this time at the Comunidad del Convento de Religiosos de Madre de Dios, which still exists to this day- a house in bad state- with three adjacent warehouses situated on the square of the convent. Here were the first wine cellars. In 1791, the founder, Don Joseph, died, leaving the houses and bodegas in Calle Truco and Plaza Madre de Dios to his five sons, the brothers Colóm Borrego, who continued to develop the wine business between the acquisition in 1798 of the Convent of Santo Domingo de Guzmán (also leased). The headquarters was now based in a house on Calle Truco called the "Ammunition oven". At last, in 1802, they acquired from Don José Helvant, some wine cellars with an entrance on “Calle Torno” of “Madre de Dios”. In 1842, the Casas-Bodegas under the name "Colóm and Company" passed into the hands of Don Rafael Colóm y Palma, acquiring, afterwards, the rest of the inheritance, the whole of the firm and the wine business. After the death of Don Rafael without any direct descendants, his heritance passed to different members of the family. 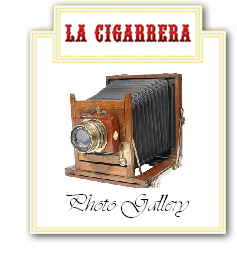 The actual bodega "La Cigarrera" was acquired in 1891 by Don Manuel Hidalgo Colóm, one of the inheritors and paternal great-grandchild of a manager of the winecellar. 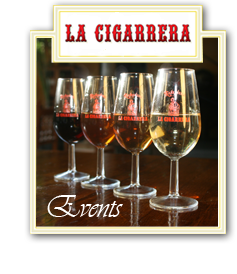 He continued to expand the wine business, covering a boom period as a result of launching "La Cigarrera" on to the Manzanilla market. After the death of Don Manuel, the firm was inherited by his children, Dña. Emilia (wine cellar of CalleTruco) and Don Manuel José Hidalgo Colóm and, on Don Manuel José's death, his son, Don Rafael Hidalgo Otaolarruchi unified the various buildings making up the actual wine cellar that then became exclusively the business of the wine warehouse. In 1990 the business was inherited by Doña María del Pilar García de Velasco Pérez, widow of Don Rafael Hidalgo Otaolarruchi. She handed over the running of the business to her sons, the brothers Hidalgo García de Velasco, a new generation of descendants taking on the business, whose surnames have a strong tradition in the history of the wine cellar business in the town. © 2019 | Bodegas "La Cigarrera"